Baptist Health is one step closer to providing even greater access to comprehensive cancer care as the final steel beams were placed for the new Baptist MD Anderson Cancer Center. Local officials, Baptist Health team members, MD Anderson Cancer Center leaders from Houston, joined the project team partners to celebrate the topping out ceremony for the new nine-story cancer center, expected to be completed in late spring of 2018. 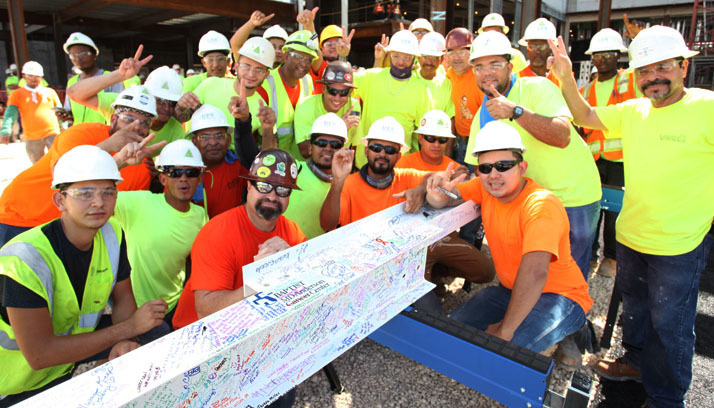 The final two beams, signed by patients, family members, visitors, team members and physicians, were ceremoniously raised to the top of the iconic building. Baptist Health with MD Anderson chose DPR Construction in partnership with Perry-McCall Construction to build their new, 330,000-sq.-ft. freestanding cancer treatment facility as well as a 250,000-sq.-ft. parking deck for a total of 580,000-sq.-ft. of new construction, which will transform oncology care delivery throughout the Southeast. 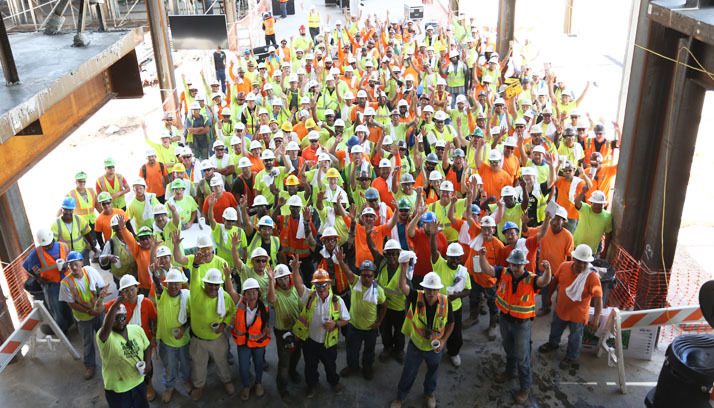 More than 1,200 workers from 45 different subcontractors have been involved in the complex and highly collaborative project. “To help fast track the project and ensure it is delivered efficiently and with stringent quality controls in place, we set up on site in a co-located office along with all of the project partners months before we broke ground, which is highly unusual,” says Matt Bishop, project executive with DPR. In addition to the highly collaborative process, the complexity of the project required the use of the latest technologies and building techniques. To be able to start the vertical construction of treatment center the team needed to stabilize the ground. This was done using a soil stabilization technique that required drilling +22ft holes in the ground every 10 feet and filling them with concrete. More than 2,000 rigid inclusions were installed to support the 580,000 sq. ft. of new construction. To keep the project moving on a fast-track, the project partners used advanced 3D modeling technology to completely design the project. “The 3D technology we used allowed us to provide real time cost feed-back while also allowing us to work with our subs to pre-fab significant electrical, plumbing and mechanical components, saving both time and money,” added Bishop. The new cancer center is being built on San Marco Boulevard across from the existing Baptist MD Anderson, which opened in October 2015. Once complete, the more than $150 million center will dramatically expand cancer care and provide hope for adult patients in the region. When complete, the new cancer center will be triple the size of the current Baptist MD Anderson Cancer Center, which opened in October 2015. Baptist MD Anderson combines the strengths of Baptist Health Jacksonville, the largest health care system in Northeast Florida, and MD Anderson Cancer Center, the leading cancer center in the nation. Physicians at Baptist MD Anderson Cancer Center and MD Anderson Cancer Center in Houston are clinically and operationally integrated to deliver the most innovative care and better serve patients and their families close to home. After the initial construction investment, the economic impact of Baptist MD Anderson is projected to be more than $2.5 billion over a 10-year period. DPR Construction (DPR) is a forward-thinking national general contractor and construction manager specializing in technically complex and sustainable projects for the advanced technology/mission critical, life sciences, healthcare, higher education and commercial markets. Founded in 1990, DPR is a privately held, employee-owned company that has grown to a multi-billion-dollar organization with offices around the country, making it one of the largest general contractors in the nation and a great story of entrepreneurial success. It ranked on FORTUNE’s “100 Best Companies to Work For” list for five consecutive years. DPR’s mission to be one of the most admired companies by the year 2030. DPR exists to build great things—great teams, great projects, and great communities. Perry-McCall Construction is a full-service commercial construction company based in Jacksonville, Florida that provides services in General Contracting, Design-Build, and Construction Management. We specialize in healthcare, higher education, K-12 education, government, industrial, and commercial construction for both public and private clients. For more information, visit http://www.perry-mccall.com/.